Shows Haussmann's renovations in manuscript. This is a large 1869 pocket map of Paris by A. Logerot. It covers the walled center of Paris as well as its immediate vicinity, including the Bois de Boulogne and Bois de Vincennes. Fine detail is present throughout the map, with important buildings and monuments, gardens, rivers, roadways, and various other topographical features are identified. Color coded by arrondissement. All text is in French. A table on the upper left quadrant notes the various districts and neighborhoods in Paris. The fortifications surrounding Paris are particularly highlighted. Paris, at this time, was undergoing a major urban renewal project under the direction of Baron Georges-eugene Haussmann. 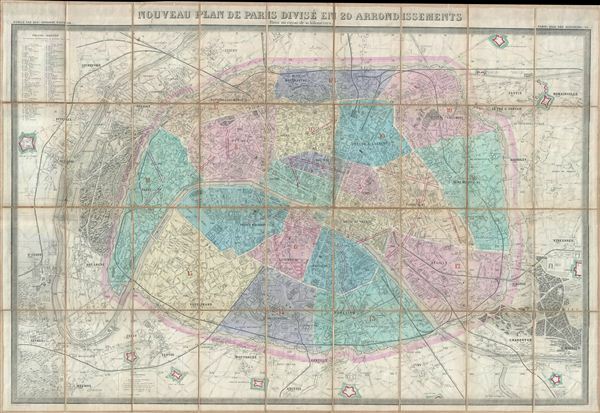 This project, begun in 1853 and completed in 1870, called for new regularly updated maps of Paris. The use of the term 'Nouveau Plan de Paris' for most maps published during and shortly after this period thus become common. Haussmann's renovations transformed the mediaeval city and created the Paris we know and love today – a city of broad spacious boulevards and lively street side cafes. The original owner of this map has updated the map in red manuscript to include several of Haussmann's new boulevards. This map was first issued by Logerot in 1859 and updated annually through the 1880s. This is the 1869 edition drawn by Ch. Smith. Very good. Dissected and mounted on linen. Original linen in good condition, except small tear near right margin. Comes with original red linen binder. Some manuscript annotations and updates.